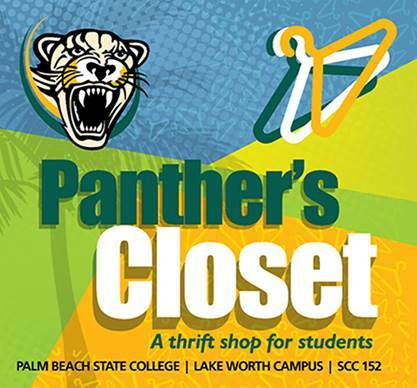 Panther’s Closet opened in March in a refurbished classroom on the PBSC Lake Worth campus. Students in the Dr. Floyd F. Koch Honors College run Panther’s Closet as part of a one credit hour service-learning course offered each semester. The store sells new and gently used clothes, shoes and accessories for $1, and the College uses the money toward student needs. It is open to current students at all PBSC campuses. “We heard about the need, and we wanted to do our part and give back locally,’’ said Lindsay Leffler, special event and PR director for The Gardens Mall. “Between our retailers and our community partners, we felt that we would be able to contribute to the Panther’s Closet.” Brio Tuscan Grille is providing the light hors d’Oeuvres. Thank you Gardens Mall and Brio for giving exposure to this great group who are helping the students. I’m hoping for a huge turnout!! Marcella and her students are doing a fabulous job on Panther Closet!